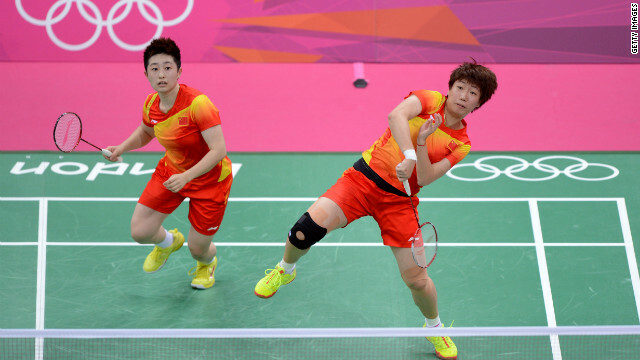 China's Yu Yang, left, and Wang Xiaoli were two of the eight badminton players disqualified from the Olympics this week. Until this week, badminton probably wasn’t one of the sports that Americans generally linked to cheating and international scandal. More like backyard cookouts and college fitness classes. Even the college gym types, though, understand there’s an unspoken agreement between participants: Championship or practice, competition or graduation requirement, you will not intentionally lose to a worthy opponent. Players might balk at this if they’re rewarded for shunning victory. That’s allegedly what was at play this week when four pairs of female badminton players were disqualified from the Olympics, accused of trying to lose their last qualifying-round matches to face easier opponents in the knockout stage. The players appear to have denied paying spectators of the competitive matches they’d come to see. The London Olympic organizing committee’s chairman, Sebastian Coe, said the incident was depressing and unacceptable. But it’s not the first time that this has happened in a tournament’s group stage. And it’s not even the only time in these very Games that a team tried not to win. The coach of Japan women’s Olympic soccer team acknowledged that it intentionally avoided scoring in its third and final group game, a 0-0 draw with winless South Africa on Wednesday, according to The Independent. Japan would have won its four-team group with a victory. But a draw put it in second, just enough to qualify for the knockout stage. Japan’s coach says he did it to ensure the team didn’t travel across the United Kingdom. Second place meant it would start the knockout round in Cardiff, Wales, where the squad already was. The winner of Group F, in contrast, will play its first knockout game in Scotland. “It was important not to move to Glasgow but to stay here and prepare for the next match,” Japanese coach Norio Sasaki said, according to The Independent. CNN tech reporter John D. Sutter writes, "Wasn't this supposed to be the 'Twitter Olympics,' where everyone rejoiced in the digital-era magic of hearing directly from the world's best athletes and scrolling through a global, real-time conversation about what must be the planet's most 'Kumbaya'-like sporting event?" Well, yes. But things don't always go as planned, as evidenced by some athletes' questionable tweets and the groundswell of digital criticism for NBC's coverage of the Games. CNN readers have at least as many opinions about Twitter as they have about the Games. Twitter is not one of those things that makes the world a better place. Knowing people's knee-jerk reactions to things is not news, or even interesting. It may not make the world a better place but it puts a real face on the world. People are just not as nice as they pretend to be. Arab Spring? Just because it doesn't make -your- world a better place doesn't mean the end result isn't positive. It's the thing the younger generation does not get....yet. They are eons ahead of us old timers with the technology...no 2 ways about it. But they don't yet understand the ramifications of the technology. Nothing happens in a vacuum. There are consequences for not understanding the public nature of all this technology. It's one thing to know how to drive a car.......quite another to understand "the rules of the road" however. 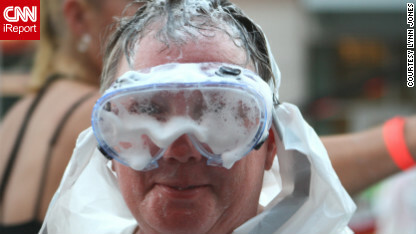 CNN iReporter Lynn Jones got pied herself at a big cream pie fight in Dallas. During a bid to break the Guinness World Record for the largest shaving cream pie fight, CNN iReporter Lynn Jones joined more than 700 people in Dallas plastered in globs of shaving cream. Describing it as a chaotic, fun and party atmosphere, she says it was a thrilling event that she didn't want to miss. "It was so much fun, and I would do this again in a heartbeat," she says. "One guy at one point said I didn't have enough shaving cream on me, so his pie went on the top of my head. I was laughing the entire time." Bulgarian police released a composite image Wednesday of the man accused of carrying out a suicide bomb attack on a bus at Burgas airport last month, in which five Israeli tourists and the Bulgarian bus driver died. The image shows the face of a clean-shaven young man with short dark hair, a pale complexion and brown or green eyes. It was created by applying "modern technologies and techniques" to the data collected, the police said in a statement. Anyone with more information about the man pictured is urged to contact the authorities. More than 30 other Israelis were injured, some seriously, in the terror attack two weeks ago. The Israelis had arrived from Tel Aviv to take a vacation at a resort on Bulgaria's Black Sea coast. The bomb is believed to have been concealed in a backpack the suicide bomber placed on a bus in a parking lot outside the airport. - He would be No. 51 in the all-time medal count, tied with Egypt and Portugal with 22 total medals. - He'd have more Twitter followers (1,000,497) than Fiji has in total population (890,057). - He'd be making more money than certain entire countries. He is estimated to make $100 million over the course of his lifetime. This is more than twice the estimated GDP of the Tuvalu Islands ($37,470,000). - He'd be liked on Facebook (5.8 million times) more times than the total number of Internet users in Greece (4,971,000). - Phelps, born in 1985, would be older than several countries including Namibia, Slovakia, Serbia, Kosovo, and South Sudan. - Phelps, standing 6-foot-4, would be taller than the average Dutch man (6 feet), considered to be the world’s tallest people. We say this, of course to highlight the legacy of Phelps, who won his 22nd medal on Saturday, extending his record of most Olympic medals won all-time. Phelps, who began swimming at age 7 to emulate his sisters, set individual world records 29 times, and he still holds records in six events. He has wrapped up a career as the most decorated Olympian ever, perhaps the greatest ever. Some commentators will argue the cases of track and field's Carl Lewis, who missed an Olympics because of a U.S. boycott, or distance runner Paavo Nurmi, who won 12 medals. Some might argue for Bjorn Daehlie, the Norwegian cross-country skier. And there's gymnast Larisa Latynina, whose 18 medals are now second all time. Vote in the poll below if you think Michael Phelps should be considered the greatest Olympian ever. We plan to keep adding to this list so let us know in the comments if you have any similar "if Michael Phelps were a country" comparisons and we'll check them out. More than half of all U.S. counties have been designated disaster zones, the Department of Agriculture reported Wednesday, blaming excessive heat and a devastating drought that's spread across the Corn Belt and is contributing to rising food prices. Agriculture Secretary Tom Vilsack on Wednesday declared disaster zone designations for an additional 218 counties in 12 states because of damage and losses caused by drought and excessive heat. The states are Arkansas, Georgia, Iowa, Illinois, Indiana, Kansas, Mississippi, Nebraska, Oklahoma, South Dakota, Tennessee and Wyoming. Nearly three-quarters of the nation's cattle acreage is inside a region hit by drought, as is about two-thirds of the country's hay acreage, the agency reported. USDA researchers added that an average of 37% of the nation's soybeans were last week ranked from very poor to poor, the lowest quality recorded since a massive drought in 1988. Two more people have died in Uganda's Ebola outbreak, officials working at a hospital said Wednesday. This brings the death toll to 16 people. They died in an outbreak that began in the Kibaale district in western Uganda. Editor's note: Paul Callan is a CNN legal contributor, a criminal defense attorney and a former New York homicide prosecutor, including in the "Son of Sam" case. He is a senior partner at Callan, Koster, Brady & Brennan, LLP. Callan spoke with CNN about the charges that Aurora, Colorado, shooting suspect James Holmes is facing. Can you explain the charges James Holmes is facing? While prosecutors could have proceeded with a more streamlined case, they have elected the safer route of charging as many crimes as possible as the prosecution begins. The case can be streamlined later on if problems develop in proving some of the crimes listed. Additional charges may also be lodged in the future relating to the incendiary devices found by law enforcement authorities at Mr. Holmes' apartment. Why is Holmes facing two charges for each person who was either killed or injured in the shooting? Is there a strategy behind this? Callan: Prosecutors have elected to assert two counts of first-degree murder for each person who was killed as a result of the hail of gunfire in the Aurora movie theater. This approach is somewhat unusual. The first of each of the murder counts alleges that Holmes “after deliberation” intentionally caused the death of his victims. This is the traditional premeditated murder charge that is used in cases of intentional murder throughout the United States. Prosecutors will seek to prove that the murders were planned and that Holmes formed an “intent” to kill his victims before pulling the trigger. A second more unusual first-degree murder count was added for each victim charging that the manner in which the killings took place evinced "... an attitude of universal malice manifesting extreme indifference to the value of human life. …” In many states, this is called a “reckless indifference” murder and is quite different from intentional, premeditated murder. It requires an act of callous and reckless indifference to the value human life which causes death. An example might be a drunken driver who speeds down a busy city sidewalk, striking and killing pedestrians in the process. Even though the killings may not have been planned or even intended, the conduct is so grossly reckless and maliciously indifferent to the possibility that someone might be killed that the law says it is just as bad as premeditated murder. In fact, in Colorado intentional murder and extreme indifference murder both carry the same potential sentences: life imprisonment or the death penalty. Prosecutors have hedged their bets by adding the “extreme indifference” counts because proving the intent to murder each individual victim may be problematic. Some victims may have been killed by ricochets, or it is even possible that Holmes’ weapon was aimed at the screen when some of the fatal shots were fired. We won’t really know all of the details until the evidence is presented. Should Holmes' lawyers assert that mental illness prevented him from forming the specific intent to kill particular victims, these additional counts will give jurors an alternative theory of guilt. Firing a weapon of any kind in a crowded theater would easily constitute an act of “extreme indifference” murder under Colorado law. 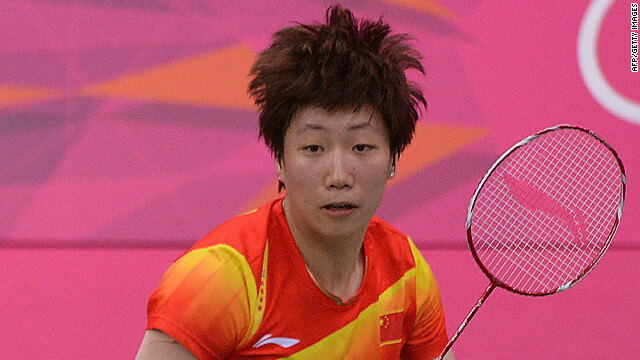 Wang Xiaoli and Yu Yang of China are ranked No. 1 in the world. Eight female badminton players were thrown out of the Olympics on Wednesday for trying to lose matches the day before, the Badminton World Federation announced after a disciplinary hearing. "After a hearing this morning before the BWF’s Disciplinary Committee the following pairs were disqualified: Wang Xiaoli and Yu Yang (China); Greysia Polii and Meiliana Jauhari (Indonesia); Jung Kyung Eun and Kim Ha Na (Korea); and Ha Jung Eun and Kim Min Jung (Korea)," read a statement from the Badminton World Federation. The players from China, South Korea and Indonesia were accused of playing to lose to face easier opponents in future matches. The Indonesian and South Korean pairs appealed the decision, the BWF said, and a decision on their appeals is expected later on Wednesday. The eight players concerned had all already qualified for the quarterfinals of the tournament before the final matches of the group stage on Tuesday night. 9:00 am ET - GSA mismanagement hearing - Allegations of mismanagement and wasteful spending continue to fester within the General Services Administration, and a House committee will look into the claims this morning. 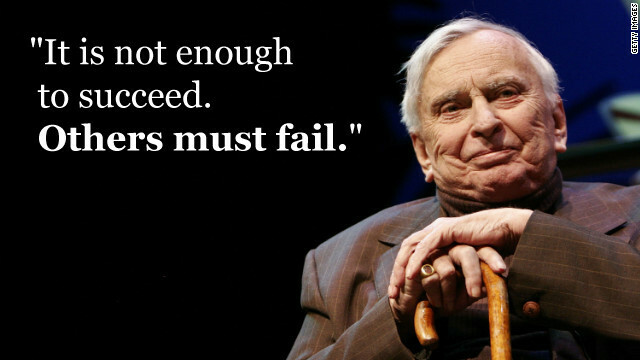 Gore Vidal said he was a once-famous novelist who was relegated to going on TV because people "seldom read anymore." * Birth name: Eugene Luther Vidal, Jr.
* Grandfather T. P. Gore helped write the state constitution of Oklahoma and was one of the first senators elected to represent the state. 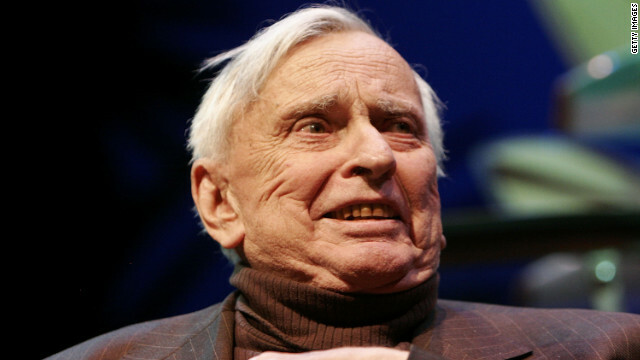 * Began writing under the name Gore Vidal in high school, taking Gore after his maternal grandfather. * At different times, both Vidal and Jacqueline Kennedy Onassis were the stepchildren of Hugh Auchincloss. He was married to Nina Gore Vidal first, then to Janet Bouvier, Jackie O's mother. * Ran for Congress twice and lost.